Well, the last of my appointments was finally over and I am ready to leave this place. For those who just started reading this blog, track back to "Friggin Tired" to read about me in High Point, North Carolina. It was an ardous non-stop working week and I am sure glad to be able to finally lift my foot off the gas pedal. Anyway, as it turned out, my meeting finished at 4pm which means that I have a bladdy 1 hours 45 minutes of slack time to kill before the first shuttle for the hotel leaves. Instead, it was decided to just grab a cab and head back for some zees before dinner. So I went to the taxi stand and there was this line of taxis all waiting. "Good, no waiting." I muttered to myself. My assigned cabby is this huge bi-focals-wearing reggae guy with the dreadlocks, the accent, the works. 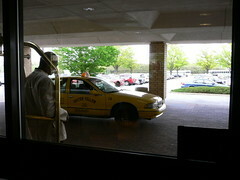 He took my taxi booking slip and said "Sheraton Four Seasons, MON?" "Ay, MON." I replied and was instantly rewarded with a dirty look. Nah hiah.... dirty look me.... I dirty look you back, MON! Reggae Dirty Look: Oi, you mocking me, is it? The cab was in terrible shape. Even the side mirror had to be held together with duct tape. 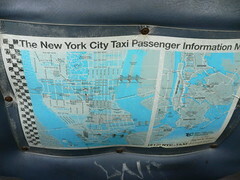 Apparently, the cab originated from New York? How did I know that? The New York map is still stuck at the back of the seat!! (Click here or photo to enlarge) Cripes, and I am in North Carolina!! The back of the cab was really cramped as it has this anti-crime barrier erected leaving me with almost no leg room. (Click here or other picture to enlarge) While it is was nippy in the morning at around 10 degrees celsius, the temperature and risen to over 25 degree in the afternoon. 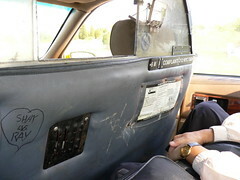 This cab has got no air conditioning and the windows were fully closed and (gasp! ), not working. Bladdy hell (literally! ), I was being incubated behind like a hatching chick at the Singapore Science Centre. Finally, I got his attention and he asked if I need to wind down the windows. Uh....... YEAH!!!!!!!!!!!! He struggled with his window switch since the two on each of my side weren't working. Eventually, the windows wheezed in the midst of whirrings and crackling of the motors to finally give me a 6-inch gap on the right window and 4 on the left. Pant! Pant! So it was a 20 minute ride with the wind coming in from both side and slapping me silly. WHOP! WHOP! WHOP! WHOP! as my hair got all messed up like Albert Einstein and I swear I was a little bit deaf when I alighted. Still, it was better than my last cabbie, 3 years ago, who got lost trying to locate my hotel and stupidly drove into drug junkie territory, scaring both our wits to pieces. Eventually, I remarked that it was obvious that he was not local and asked where he was from. "Egypt." came the sheepish reply. Wah leow.... even further from where I came from........ Good grief. Northwest Airlines, I am ready to leave now. I'm really scared of US cab drivers. I don't take cabs at all. I would either walk or take the bus. Ahh... that clues me that you are living in the city. Try someplace ulu like mine and you will realised that there is no way to walk on the streets coz sidewalk is non-existent. i think any construction truck in singapore would have put that cab to shame. whateverstreet: Let me help you rephrase that. any contruction truck on Pulau Ubin would have put that cab to shame. haha, i thought i was the only one who had non-verbal exchanges..
Ahh.... my dear Nethia, I think you a bit confused liao. The most recent one is definitely Jamaican. The Egypt one was 3 years ago. 2 separate incidents. Looks like it would be easier to locate the holy grail than to actually find an american cabby.